Shocked residents found a ‘miscarried foetus’ near the entrance of their flats in High Town in a disturbing incident last week. 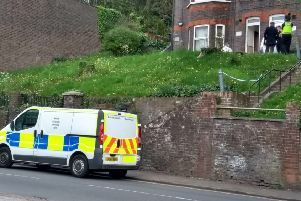 The grim discovery was made at Villa Court near the end of Old Bedford Road on Monday, February 11, followed by the appearance of more blood at the same spot the following day. One shocked resident said: “I can’t take this anymore... crack-heads get into the block everyday, used condoms, filth and now this. Graphic images have been sent to the Luton News from the scene. Cllr Michael Garrett said: “I had a telephone call from a lady – she wouldn’t give a name – she just said that there had been a miscarriage and the remains of the miscarriage were all over the floor of the entrance to Villa Court. “She’d been on the phone to the town hall and couldn’t get hold of her councillors, so I got the environmental health team down there. A Beds Police spokesman said the force had no record of the incident being reported to them. A Luton Borough Council spokesman added: “We take the health and wellbeing of everyone living in Luton extremely seriously.